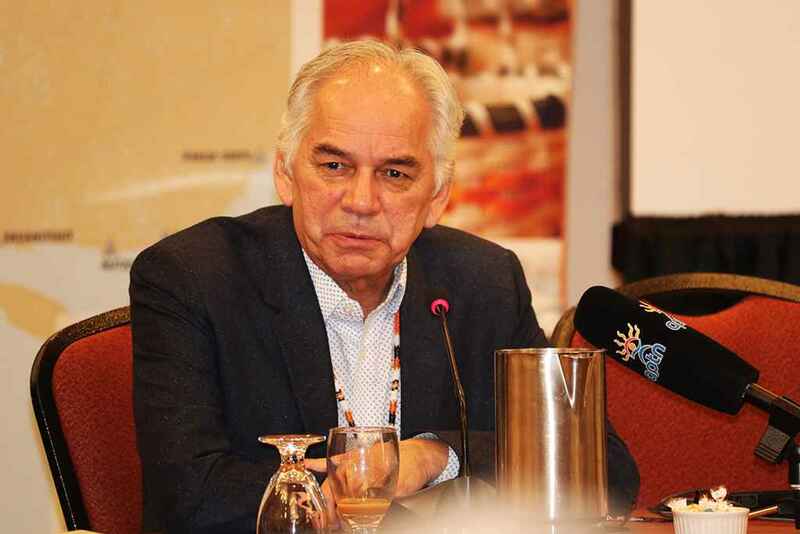 Ghislain Picard was re-elected as regional chief of the Assembly of First Nations Quebec-Labrador (AFNQL), as members gathered to vote last Wednesday (January 30) in Montreal. Picard, Innu from the community of Pessamit, has held the position since 1992, comprising 43 communities of the 10 nations in Quebec. This is his 10th three-year mandate and he won with 30 votes out of 39. Picard had confidence during the election process. “Obviously once you made a decision, then you are ready to carry work and take responsibility, but at the same time, it is also important to be clear in your mind, so it is clear for the people you speak to about what you are seeking to accomplish; so I would say I have strong points to,” he said. He thinks bringing Onkwehón:we issues forward in Canada and providing people with information of the political environment is essential. “It is important for First Nations in Quebec and Labrador to do the kind of work that I have been doing,” Picard said. He emphasized the need to reform the AFNQL with the help of all Indigenous leaders. “We certainly need to re-focus on the initial responsibility that we have as leaders. The stronger we will be, the more engaged we will be as nations, then the more difficult is going to be for governments. To me, it’s that time for us to come together and put more energy, and make these tables stronger,” he said. National chief of Assembly of First Nations Perry Bellegarde greeted Picard with the election results. “Through his leadership, he has made significant contributions to the Assembly of First Nations and First Nations across the country. I value his extensive experience and deep knowledge of our issues,” said Bellegarde in a press release. In his final speech, Picard said he was very proud to have the continued confidence of the chiefs. “I intend to represent them with dignity and to implement our collective priority of strengthening the relationship between our nations and our communities,” said Picard. His only opponent, Gilbert Dominique, congratulated the re-elected chief and said he was happy with the experience. “At this moment, we know that we all have the same objectives. I’m leaving with the greatest motivation that all the chiefs at the table here will keep something extraordinary for the communities. I hope we will succeed in the political strategies to meet our needs and more than that,” Dominique said in his speech. Wina Sioui, the president of the Assembly, explained the meeting was scheduled for three days. “Tuesday both candidates went through a two-hour question period, each community leader brought questions forward around what their issues are, and the candidates had time to answer,” she said. For the election day there were 39 present voting members out of 43 community chiefs, Sioui said. MCK chief Gina Deer was given the proxy to vote in the AFNQL election by council grand chief Joe Norton, who was unable to attend the meeting due to other commitments. “It’s important for people to be able to have an opportunity to vote for individuals because we have various issues in the community, some of them are heavier than others,” she said. She thinks both candidates were strong. “It’s always important to look at two individuals, but we do know Ghislain, he spent a lot of time in Kahnawake, he has good working relationship with us. We understand that some people would like to see some change, but again, we have established a good working relationship with Ghislain, and we hope that continues,” said Deer. She said the leaders are trying to establish something with the new government in Quebec. “Mr. (Francois) Legault had made some comments about the relationship building he wants to do with First Nations, so we are going to hold them to task on these comments,” she said. Deer believes it is up to each community head to ensure they have representation at this table. “I think it could be more utilized by a community and bring agendas forward through the AFNQL in a united way, because over the last several years people are being teamed up to push on the truth and reconciliation and trying to bridge that gap and educate non-Natives; and it’s working, today. It’s been a long slow process, but there is a moment of building,” said Deer.